Monday rolls around quickly it seems. Time again to join in Cathy’s challenge In A Vase On Monday. The goal is to fill a vase using materials gathered in one’s own garden. For a few days I have been planning to create an arrangement using mostly the young, green florets of Hylotelephium telephium ‘Herbstfreude’ (Autumn Joy). Once I started putting the vase together I quickly realized I was not prepared to cut enough stems to fulfill my original vision, preferring instead to allow the sedum to mature for a colorful display in the September garden. Autumn Joy will turn dark rose and eventually deepen to coppery-red. It is already beginning to show some pink color as the star-shaped flowers open. 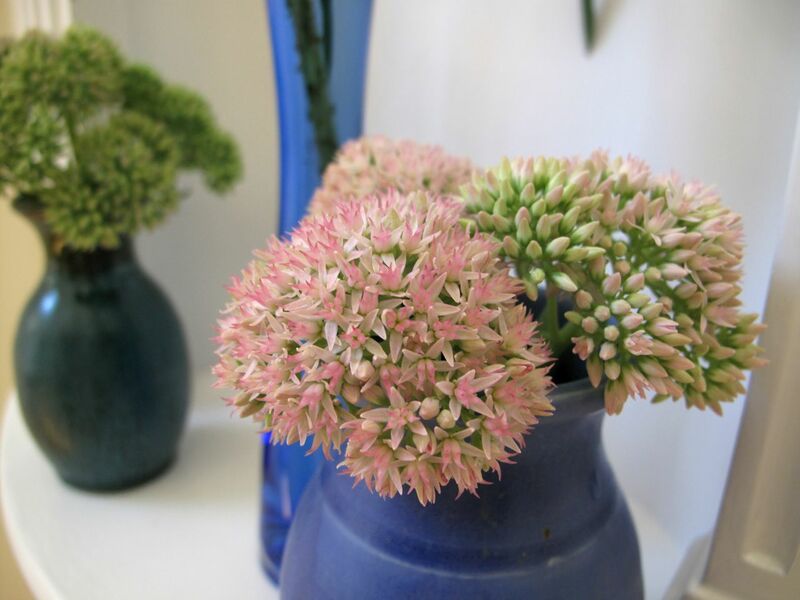 Taking a cue from the pink hue, I paired small vases of sedum with a Cleome hassleriana (Spider Flower). 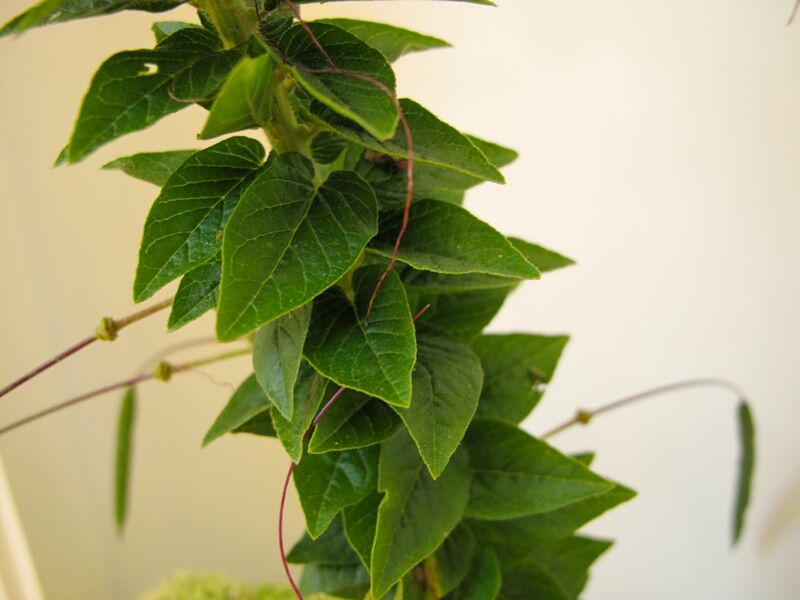 This single stalk of cleome features flowers in varying stages of openness, as well as interesting leaves and seed pods. 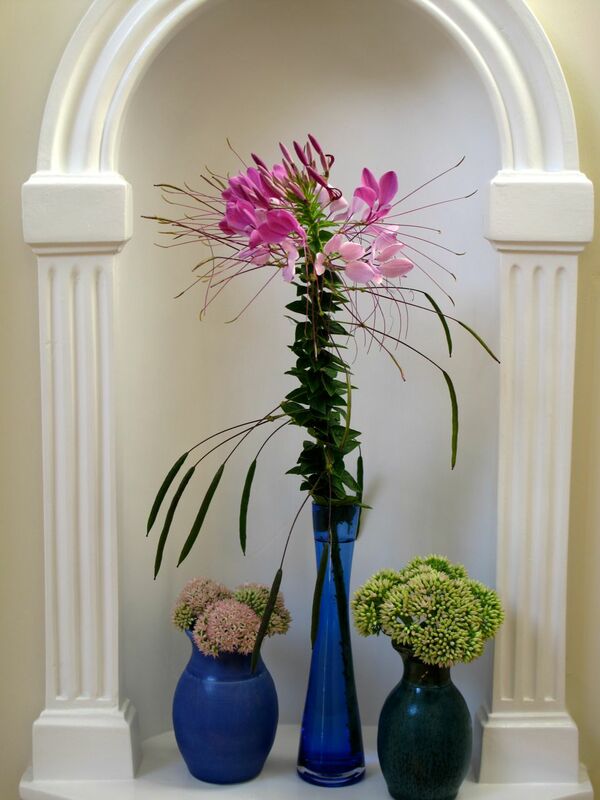 More variation in height between the two smaller vases of sedum might improve the arrangement’s overall balance. 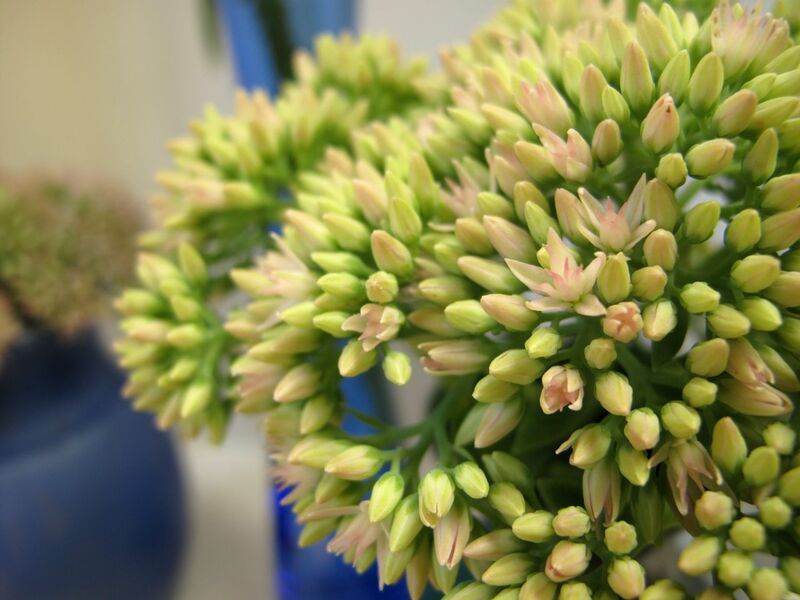 I had already shortened the sedum stems, so could not have them sit taller in the vase. Given more time I would have tried placing a prop underneath the green vase to lift it upwards or experimented with different vases. This entry was posted in garden and tagged Cleome hassleriana (Spider Flower), flower arranging, flower design, Hylotelephium telephium 'Herbstfreude' (Autumn Joy), in a vase on monday, late summer garden, nature photography on August 25, 2014 by pbmgarden. Susie I am always so amazed at what you create…just a few bloom, carefully chosen vases and placed perfectly and what a dramatic effect….love it and those Autumn Joy will look lovely as they open and mature. Thanks Donna. As you know, it’s fun to see what we can put together each week and I’m usually surprised too. I hope the sedum will hold up well in the vases. The Sedum are such a sign of autumn. They are at about the same stage in my garden, but while there are flowers on the cuttings bed they are safe from my secateurs. 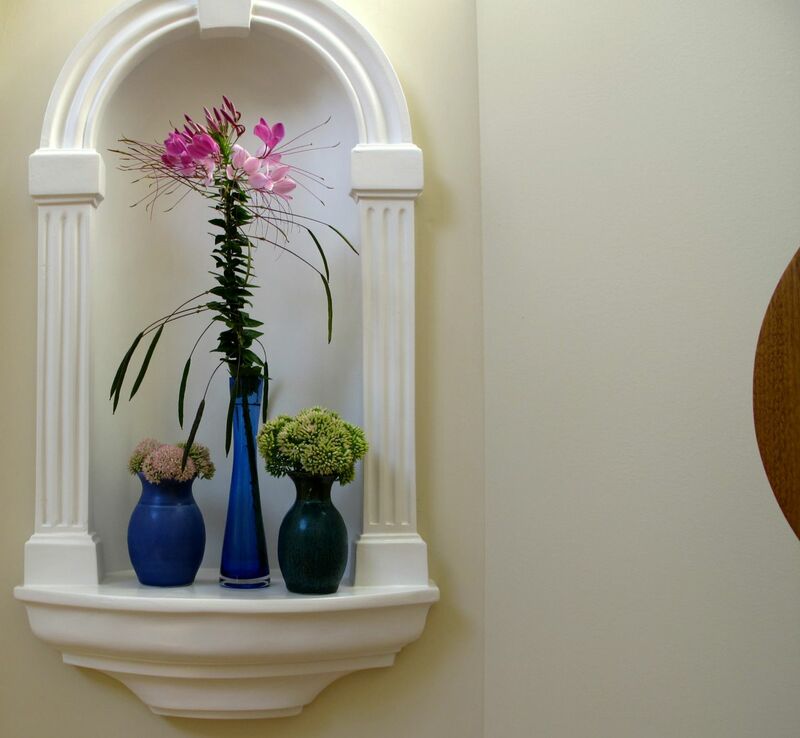 The tall blue glass vase is so beautiful Susie, you have a lovely collection of vases, I always enjoy seeing what you have chosen. I wasn’t as brave about cutting the sedum as I thought I’d be either. The blue glass vase is one from my daughter’s bridesmaids luncheon. We used flowers from the garden on the table and each guest took home her own vase. Thanks so much Cathy. I like the sedums too. Thanks. Yes, the cleome is thorny and sticky, especially the older stalks, but I think the flowers will hold up well indoors. Cathy, hope you get a chance to enjoy some cleome flowering. I was given my cleome as seedlings years ago and those seedpods do their job. New ones spring up all over the place, but they are easily managed. What a lovely combination you have put together this week. I love the contrasting heights and the blue glass. I have grown white cleome for the first time this year but have been put off cutting it by the spines – you are clearly braver than I am! Thanks Julie. Bet your white cleome is lovely. The cleome can be sticky and spiky but this one was fairly young I guess. I didn’t notice it being a problem. Thank you. Hope you are having a good gardening summer too. Beautiful use of multiple shapes and colors…Very elegant. Thanks, glad you like it Charlie. I like experimenting with these arrangements. Delightful, and that Cleome is such a flamboyant creature! Thanks Annette. Cleome has interesting components, each of them is showy. 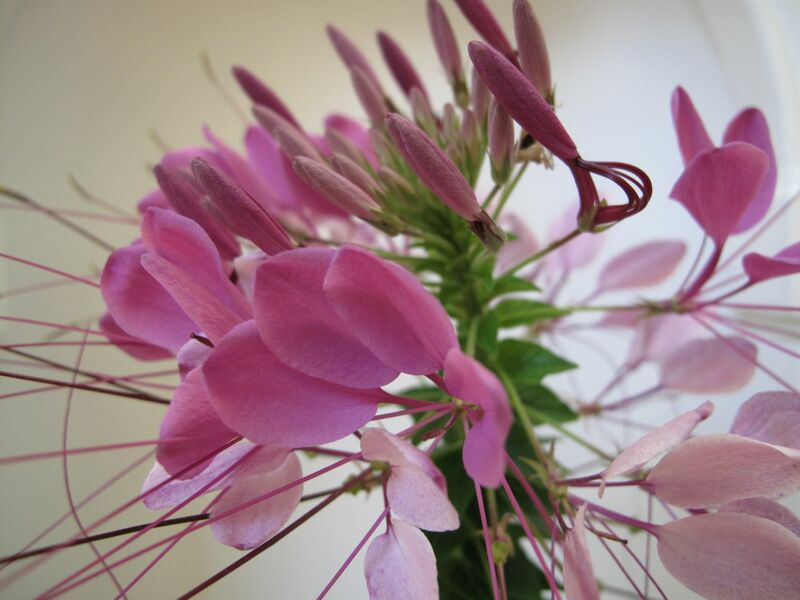 I love cleome, yours looks really stylish with the vases of sedum. I wouldn’t be without sedum for late colour and for the butterflies which love it. Chloris I hope the butterflies find my sedum soon. There have been very few here this season. Hi Susie, love your very dramatic display this week. Your cleome is amazing – it’s one of my all time favourite flowers but, despite trying several times, I’ve yet to grow them successfully. Many thanks for your earlier comment on my less spectacular offering. Yay, another cleome fan! I adore it Elizabeth. Too bad it doesn’t thrive for you, perhaps it’s the difference in temperatures that make it an easy one to grow here. Very interesting combo. I really like Cleome and now you’ve jogged my memory. I had it in my garden for quite a while. Then it just disappeared and I forgot about it. Maybe I’ll try again. I will try cutting some of the sedum. I have plenty and some of it’s in spots where it won’t be missed if I take some of the florets. Stephi, the sedum is holding up well in the vases so I think you’ll enjoy it inside. Beautiful arrangements, but – Hylotelephium telephium? When did that happen? These botanical names are mysterious. Hylotelephium telephium just showed up on a plant label a couple of years ago. I think I like the way the cleome seed pods hang down best of all! AJ sedum can be a little overdone around here, but I always like the subtle coloring and full flower heads. The cleome seed pods have a lot of character. The Autumn Joy sedum is attractive for such a long period that I am happy to give it space.